We are fast approaching our next general elections, which many say, could well be a make-or-break option for the voters. I see merit in this make-or-break part of the statement. When for governance, in last 10 years all that we witnessed is blatant misuse of power and rampant loot across the length and breadth of the nation; it certainly calls for an objective retrospection when we stand in a queue to vote our next government. In India where we have more number of political parties than the pooling booths, with every moron remotely related to politics, floating his own party every second day; here elections are more of an exercise to vote out someone than voting in. And certainly, looking at what we had to suffer in last decade of misrule of Congress, not sure whom we should vote in but for sure we need to vote out his grossly corrupt, arrogant and good for nothing UPA out of power. More appropriate would be, if in the process we can teach them a good lesson or two for their complete mismanagement of the country, not just voting them out. As it is, we the citizens of India deserve far better, mature and honest governance than what this lout party offered us in last one decade. Roughly we have less than a year left for our next elections. Though the political Pundits foresee the elections being preponed to somewhere during Diwali, I am not that interested on the timing but the nature of the election. Knowing Congress and their filthy politics of rolling out soaps during the election years, the least they wish before they prepone the elections is the passage of something called Food Security Bill. And to do that, they have only the Monsoon session of the parliament at their disposal. Looking how the parliament was stalled in its last two sessions, pertaining to one issue or the other, this Monsoon session is expected to follow the same path to the gutters. As I write this, the first day of the Monsoon session is adjourned till 12 Noon, owing to the ruckus created by few Congress MPs because of the Telengana farce. So for me, even though the timing is least important, I don’t see the elections getting held before its routine time. Coming back to the topic. In recent few weeks, two major media houses, CNN-IBN and Times-Now published their exit polls on who possibly would win if elections were to be held today. I never was a great believer of exit polls, knowing how complex our political system is. Knowing how votes are garnered by all means except genuine concerns, predicting what the outcome could be is as error prone as predicting Sushil Kumar Shinde’s next blooper. Like Sushil Kumar Shinde, even our voters are capable of throwing a surprise or two with their stupidity. So I am not reading too much into these exit polls; both what CNN-IBN said or Times-Now shouted. That said, at least two states and their exit polls (in both these surveys) caught my attention. Those states are Bihar and Uttar Predesh. Let’s look how these two states poise from now on till the election dates. Now you may ask, why these two states only? Here is the thing; Bihar has got a very interesting semantics post that unceremonious divorce between JD(U) and BJP. And as for UP goes, one can hardly imagine forming the government at the center without performing handsomely, if not conquering UP. Let’s start with Bihar first. Not long back, I wrote in a separate piece, how Nitish Kumar could do a blunder if he decides to snap ties with BJP. And that is precisely what is reflecting in the exit polls. The once thought three way conflict in Bihar between JD(U), RJD and BJP would hamper the BJP more than JD(U) is proving itself wrong. Not only that, the smart Alec that Nitish Kumar tried to be is actually backfiring in more than one way. As I wrote in that post, Nitish first must go with the numbers before throwing around his new found so called secular syndromes. In the last assembly elections, though JD(U) emerged as the largest party, BJP wasn’t trailing too far behind. A blind man could see the joint support of the voters for both the parties, not just for Nitish Kumar. I am not sure what kind of idiots do come as the advisory members of Nitish Kumar, but the hallucination that he suffered thinking him to be the poster boy of Bihar is certainly a very bad calculated risk. His one-sided approach in snapping the 18 year old tie, I am sure wouldn’t have gone down well within a section of the traditional BJP-JD(U) voters. Now the problem with Nitish Kumar is that, he landed himself in middle of nowhere. While BJP successfully seem to retain its vote share, Nitish looks like losing a considerable lot because of his hypocrisy. Trying to incarnate himself and the party to the Indian version of secularism isn’t paying any dividends either. And there is a reason to it. Hawks like Lalu are playing divisive and hate politics from the day they entered the forum. If at all there is any existence of polarization on religious lines in Bihar, the Lalus of the world have already done that. Not only the polarization job is complete and done away with, the flag bearers of secularism in the state are actually sitting pretty with their chunk of Muslim votes. Rather than a division in Hindu votes, in all likelihood there seems to be a division in the Muslim votes in Bihar. In a three way fight for appeasement, along with Lalu, the Congress and Paswan are all but pulling each other’s Dhoti for that edge. In a situation where morons like Lalu are anything but even ready to convert themselves to Islam for the votes, a certain Nitish Kumar waking up one fine morning and vouching for the ‘media defined secularism’ by putting on a secular mask, will be as fruitful as Mamata Didi as the CM of Bengal. Poor Nitish, who thought it would be a cake walk for him to harvest Muslim votes in his kitty just by opposing Modi, is in for a rude shock. Thanks to our rotten politics and equally rotten media, because of Nitish’s long association with BJP, the Muslims would see no reason to move towards him even if he could be far, far better than the morons like Lalu, Congress and Paswan put together. I guess Nitish didn’t count for something called our notorious and paid media and the false perception and fear psychosis that they are brewing around BJP and all its allies. A sharp fall from 2009 21 seats to expected 11 seats only reminds me a famous proverb – ‘Dhobi ka kutta, na ghar ka na ghat ka’. Feel sorry for Nitish and his act of shooting on the foot but that’s what precisely happens when one dreams of becoming the PM of the nation just because he has 20 odd MPs from his party. Now let’s see how UP is shaping up. This is the only state where both the exit polls varied sharply with their numbers. While CNN-IBN predicted a good 33 seats for BJP, Times-Now associated only 11 to BJP while giving 33 to Samajwadi Party. But one thing was common though. Congress was seen getting routed on a state where the Yuvraj and the Queen fight their general elections. The expected seat numbers struggling hard to reach even a double digit ensures how badly Congress going to get smothered in the state in 2014. All estimations unearthed a shocking fact as well. If things go little wrong somewhere, even the queen may end up losing her seat from Rae-Bareli. But hang on, it is not only Congress who are getting their posteriors whipped badly. Along with Congress, the elephant lady is also going to get a tight slap from the voters. In fact UP in all probability looking like shutting the door on the faces of BSP and Congress. In an important state like UP, if the exit polls hold any water, it is all but turning into a two way fight between BJP and SP, making all other parties, more-or-less name shakes and pebbles in the foray. No wonder why it is barely a year left but the gimmick king Rahul Gandhi hasn’t yet started staying in Dalit huts overnight or pulling all such other nonsense stunts. The Yuvraj may be a dumb head but there are still a handful number in Congress who have got enough brain to clearly see the drubbing in UP, with or without the Yuvraj and his gimmicks. Hence there could be an advisory for the Yuvraj, not to waste his time in throwing tantrums in UP anymore. That said a number of ‘33’ for SP looks a little exaggerated. More so when people know Akhilesh Yadav is all but busy screwing up the state, 360 degrees in his yearlong governance. Though governance was never a concern for UP voters but the abject failures of Akhilesh government are prominent enough, even for mental retards to pick. In a yearlong period Akhilesh has done nothing, except following the footsteps of his father in the art of loud farting. Oh yes, along with unnecessary farting he also has suspended few honest IAS officers in the process. Jokes apart, SP will gain from their 2009 tally but not sure if it will reach beyond 30. At best I see SP congratulating themselves if they even reach the number 25. If at all they wish to reach anywhere near the exit poll numbers, SP will have to get rid of many things in a hurry which includes but not limited to, Akhilesh Yadav and Raja Bhaiya. But that looks highly out of the way. All-in-all, it is going to be an exciting election. It will be an election of characters and mantel, not necessarily in that order. 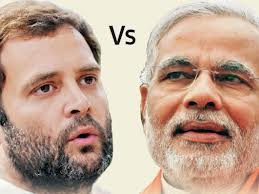 Narendra Modi is all but declared as the NDA’s PM candidate while people are waiting to see if Rahul Baba would be thrown in as a challenge from the Congress side. Though highly unlikely, if Congress makes the mistake of feeding their loving Rahul Baba against a staunch opponent like Modi, Baba not only would end up with a shock powerful enough to make him a complete retard from his present halfway stage, Congress stooges may very well rue why they didn’t hear to Mahatma Gandhi when he advised all to disband Congress post-independence. Last hope for India, a certain Narendra Modi at the helm post 2014 elections. Amen!! Congress & media hand in glove, both stopped criticizing Namo at the same time, since Gaya bombings. (Oh these terrorists are not supporting them..) They realized that too much propaganda was benefiting Namo so they took a breather. Please avoid those silly gramatical errors or typos like "didn't heard" in the piece, "didn't happened" in an ealier piece and similar stuff on many occasions. Othrwise brilliant ! and fight. Nobody else will. For this there is a simple solution. Everyone so called "Educated" class people should move their 'Tashreef' from the sofa and go to voting center and VOTE. Because these corrupt politicians knows that poor and uneducated will take money and vote for them, and in reality they are the one who goes out and vote in max number and therefore these corrupt will win. So antidote for this problem is, all educated people have to go out and vote. P.S. If you encounter any corrupt one who offers you Rs.3000 for your vote then please do not try to teach them a lesson by lecturing him/her or try to expose or fight. Just take the money and go out with family and enjoy!!! !